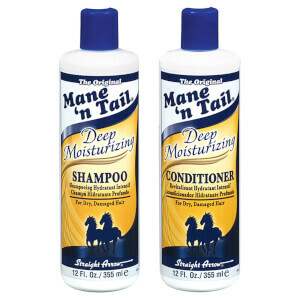 Nourish and protect hair with Mane 'n Tail's Herbal Essentials Conditioner; a fortifying formula that works to prevent breakage and split ends without weighing you down. Harnessing the powers of natural herbs and an Olive Oil complex, the strengthening conditioner revitalises the hair and scalp, whilst improving manageability and controlling frizz for salon-worthy results. Restores silky smooth hair and enhances body to reveal healthy, bouncy locks. Water, Cetyl Alcohol, Cetearyl Alcohol, Stearyl Alcohol, Behentrimonium Chloride, Hydroxyethyl Ethylcellulose, Hydrogenated Polydecene, Distearyldimonium Chloride, Dimethicone, Sweet Almond Oil, Oleo Europaea (Olive) Fruit Oil, Shea Butter, Tetrasodium EDTA, PEG-150 Stearate, Polysorbate 60, Steareth-20, Stearamidopropyl Dimethylamine Lactate, Keratin Amino Acids, Wheat Protein, Fragrance, Laureth-7, Ethylhexyl Methylcinnamate, Lauryl Alcohol, Panthenol, Oleo Europaea (Olive) Leaf Extract, Equisetum Arvense (Horsetail Extract), Larrea Divaricata (Chaparral) Extract, Tussilago Farfara (Coltsfoot) Flower Extract, Aesculus Hippocastanum (Horse Chestnut) Seed Extract, Spiraea Ulmaria (Meadowsweet) Flower Extract, Trifolium Pratense (Clover) Flower Extract, DMDM Hydantoin, Niacin, L-Arginine, Citric Acid, Blue #1 (CI42090), Yellow #5 (CI19140), Benzyl Benzoate, Coumarin, Butylphenyl Methylpropional.